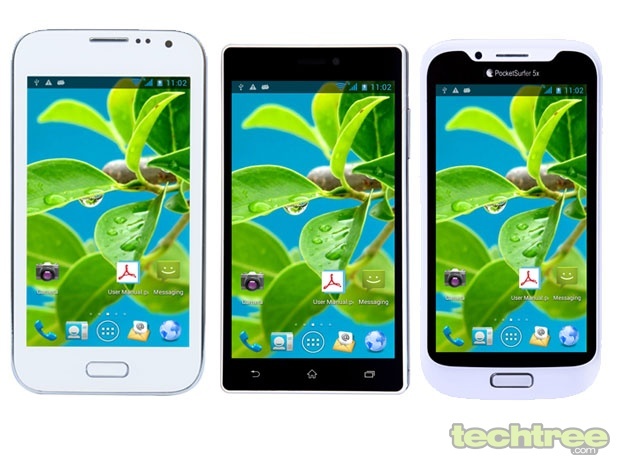 DataWind unveils three affordable handsets between Rs 3500 and Rs 6500 in India. DataWind, the creator of Aakash tablet, announced its entry into the smartphone market with the launch of three entry-level PocketSurfer phones in the Indian market. All three phones are dual-SIM handsets and feature a 5-inch touchscreen. The company claims that even on traditional GPRS/EDGE mobile networks, web pages are delivered in 3 to 5 seconds at a fraction of the cost. The basic model is the PocketSurfer 5X, which comes with Linux OS and front VGA camera at Rs 3500. The second in the range is PocketSurfer5, which runs Android 4.0, and sports a 2.0 MP Rear camera, and front VGA camera, and is priced at Rs 5000. The third model in the range is the PocketSurfer3G5. It sports the best specs in the PocketSurfer5 range. It offers 3G mobile broadband, HD quality video, and mobile gaming experience. It has a 5 MP rear camera and is priced at Rs 6500.